As I watched Robin Hemley get healed on the Filipino island of Siquijor, I was surrounded by three dozen writers, part of the 2011 Iowa Overseas Writers Workshop, most with their notebooks out; only eight or so were with me in the bamboo room, raised above a chicken coop. The rest were outside the thatched hut, wilting in the tropical balm but jotting away. The writers were scribbling thoughtfully, probably the same details Robin noted later: how the healer made a cross with coconut oil on the back of her patient’s neck. How the healer was 87-years-old, barefoot with rough, taunt skin and cropped hair. How she blew bubbles through a straw into a glass and circled Robin on her knees (and awkwardly passed his crotch). The once-clear water in the glass changed to a chummy red and then a dark green. The healer paused, still on her knees, took out two bits of jagged material, and handed them to Robin. These were scales from his attacker, the healer informed. The healer was all purpose, whatever ailed you. A cultural immersion project for most of us, but Robin was on a mission. He intended to remove a curse given to him in New Delhi by a beggar holding a basket of baby cobras. The lady held the snakes out to Robin (to his face as he recalled), and seemed to be expecting money. He meant to supply, but in going for his wallet, his wife called to him that their taxi was waiting. So he left, but before he could, the woman pointed at him and yelled obscenities that made the crowd in the market turn and stare and quiver. He assumed he’d been cursed. Robin, one time director of the Iowa MFA program in nonfiction, author of eleven books, Guggenheimed, is not exactly without success. This story was one he planned to sell to Lapham’s Quarterly, one of those Barnes & Nobles glossies that had already accepted his pitch. It would be hard for me to match Robin’s ability to render this healing. But imagine thirty writers in the same room or standing just outside in the mud and grass with the local men and children singing karaoke next door, these writers with their notebooks out like good students noting every detail. That sounded like a curse if I’ve ever heard one. I put my notebook away: who needed three dozen reports about the same incident? But, and here’s the crux, even if all thirty did publish Pulitzer-prize stories, essays, poems and plays about Robin’s curse, that wouldn’t reflect or detract the notes I took and the story I kept for later. Far from the rigors of the Russian ballet, or the meat-grinding nature of pro-sports, writers are not gladiators. We are not the adrenaline-saturated, bloody thirsty cohorts of New Rome’s underwear ad-generating spectacle. Thirty writers do not enter a dome expecting only one to leave. Sure, there are contests and limited funding; getting aboard this Overseas Workshop was competitive. But we’re a breed engineered, thankfully, to distrust trophies. What signals our profession, calling, broken hearts to bleed on pages is that, if we battle at all, we wage war with the self. I can tell this anecdote because it’s mine, but only if I’m tenacious enough to overcome my self-distrust. The lie was that there could be only one story, one poem, one essay. But countless great works of literature are poised on the cusp of one person falling for another. I was going to get healed after Robin. But, instead, after Robin’s curse was removed I gave up my seat to another writer who scribbled away as the Healer’s bubbles turned the water brown. I knew I could get healed the next day (we were on the island for three), and I did. The story of my healing, surrounded by staring children and curious chickens beneath the floorboards where I dropped my pen seems less interesting, more of a classic neocolonialist escapade than the irony and bizarre nature of three dozen writers scrawling notes about a story that was and wasn’t theirs. In other words, writing is not about originality, but piecing together the fragments of memory and observation, about reconstituting reality with the salt of imagination. The world we write about, and, indeed, what we write is never just our own. 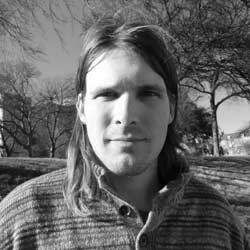 A native Texan, Clinton Crockett Peters has an MFA in nonfiction from the University of Iowa. He is pursuing a PhD in creative writing at the University of North Texas and has work published or forthcoming in Shenandoah, Green Mountains Review, Upstreet, Waxwing, The Rumpus, American Literary Review, Los Angeles Review, and Denton Record Chronicle. He has worked as a wilderness guide, an English teacher in Japan, and a radio DJ.